“I’ve known these guys forever and we’re going to have a blast on the road performing for our fans. It’s even more meaningful that we’re getting into the Christmas spirit and giving back to The Salvation Army—that’s what it’s all about,” said Vassar. Country music singer and songwriter Phil Vassar began his career in the late 1990s as a co-writer, working with a variety of artists, including Tim McGraw ("For a Little While", "My Next Thirty Years"), Jo Dee Messina ("Bye, Bye", "I'm Alright"), Collin Raye ("Little Red Rodeo"), and Alan Jackson ("Right on the Money"). This string of successful hits led to him being named by ASCAP (American Society of Composers, Authors and Publishers) as songwriter of the year in 1999. That same year, Vassar signed with Arista Nashville as an artist in his own right, releasing his eponymous debut album in 2000. His debut launched five hit singles on the U.S. Billboard country singles charts and was certified gold by the RIAA. 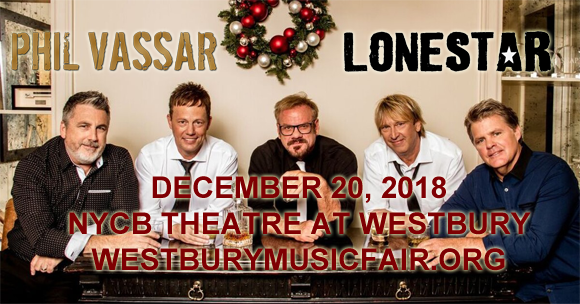 To date, Vassar has released nine studio albums, including one greatest hits compilation and one holiday album. He has charted nineteen Billboard Hot Country Songs singles, including two number-ones: "Just Another Day in Paradise" (2000) and "In a Real Love" (2004).